Sound the horns of battle and prepare to Duel! In the twilight of Summer 2018, Yu-Gi-Oh! 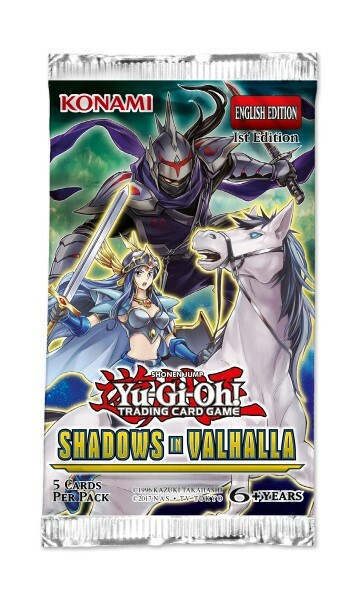 TRADING CARD GAME Shadows in Valhalla will bring Duelists the opportunity to change their own fate and wield the incomparable Mischief of the Time Goddess! Once thought to be too powerful to ever be printed in real life, this classic Spell Card from the original Yu-Gi-Oh! anime skips your opponent’s turn completely and moves the game to your next Battle Phase. But that’s just the tip of the iceberg in this 60-card all-foil booster set! Hot off the heels of his brother, Leon’s, fairytale inspired cards from Yu-Gi-Oh! TRADING CARD GAME Battles of Legend: Relentless Revenge, Zigfried von Schroeder’s Valkyries are set to make their debut in Yu-Gi-Oh! TRADING CARD GAME Shadows in Valhalla! The Valkyries retain their abilities from the anime, but each card is boosted to be more compatible with the current game environment. This strategy aims to Summon 1 of each Valkyrie from the hand with Ride of the Valkyries, use their abilities to destroy your opponent’s best monster and copy its’ ATK, then win the Duel by attacking with all your Valkyries twice without giving your opponent a turn in between, courtesy of Mischief of the Time Goddess! Yu-Gi-Oh! TRADING CARD GAME Shadows in Valhalla also reignites the Ninja strategy! Ninja Decks combine powerful Warrior-Type Ninja monsters with Ninjitsu Art Spell and Trap Cards. You need a steady supply of Ninjitsu Arts to outwit and confound your opponent, so this set includes a Ninja Link Monster that Sets a Ninjitsu Art directly from your Deck every turn, and a new Ninjitsu Art card that lets you disguise your Ninja as your opponent’s monsters! If you don’t have any Ninja or Ninjitsu Art cards, don’t worry, because some of the basic cards you’ll need to build this Deck also appear in Yu-Gi-Oh! TRADING CARD GAME Shadows in Valhalla. You know their names, but you dare not of speak them! Drawn to the light of a trapezohedron, three new ancient Entities emerge from the depths of eternity to exert their maddening influence over your Duels. But those aren’t the only strange happenings afoot… Aleister the Invoker resumes his experiments, but gets a little more than he bargained for in Yu-Gi-Oh! TRADING CARD GAME Shadows in Valhalla! In addition to tournament mainstays like Aleister the Invoker, Invocation, and Invoked Mechaba, this booster set introduces a Link Monster version of Aleister that gives Duelists greater access to powerful Spell and Trap cards like Invocation, The Book of the Law, and Omega Summon.